Niall P. McCarthy, a Principal at Cotchett, Pitre & McCarthy, LLP, is a graduate of the University of California at Davis and Santa Clara University School of Law. He has practiced with the firm since 1992. McCarthy has repeatedly been selected as one of the top plaintiff attorneys in California by multiple publications, including the Daily Journal, the National Law Journal and Super Lawyers Magazine. He has received California Lawyer Magazine Attorney of the Year (CLAY) Awards, most recently in 2019. 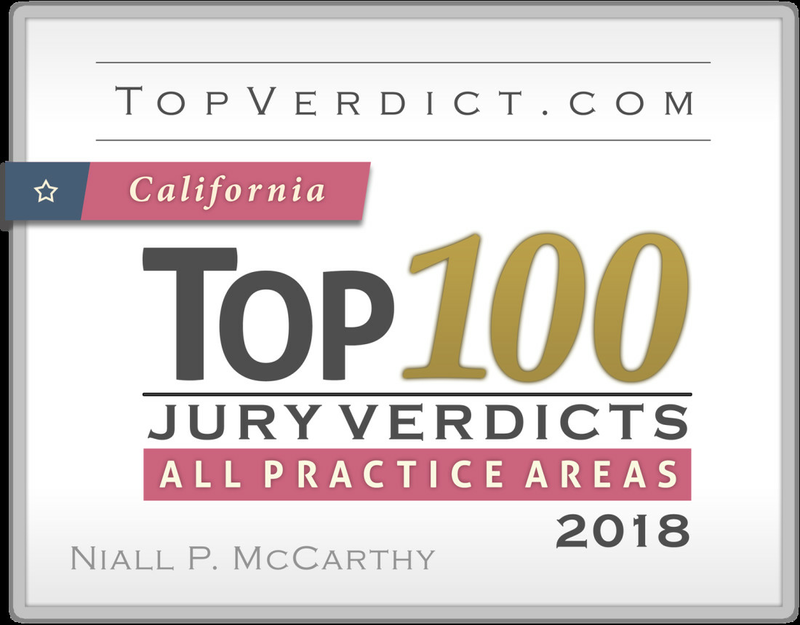 McCarthy has been named a Top 100 attorney in California multiple times by the Daily Journal and by Super Lawyers Magazine. He has the highest possible rating, AV, from Martindale-Hubbell. McCarthy was awarded the Trial Lawyer of the Year Award by the San Mateo County Trial Lawyers Association. In 2016, 2017 and 2018, he was selected as one of the Top 50 Plaintiff lawyers in California by the Daily Journal. McCarthy has also been elected to the American Board of Trial Advocates (ABOTA), the International Society of Barristers and the International Academy of Trial Lawyers. McCarthy has represented qui tam Relators in False Claims Act cases in state and federal courts. McCarthy handled the Hunter Laboratories Litigation in which he negotiated the then largest False Claims recovery in California history, $301 million. In the mid 1990s, he was the lead attorney in a groundbreaking case brought under the California False Claims Act on behalf of the University of California San Francisco with respect to direct and overhead costs to the university. In 2015, he was the lead attorney for the whistleblower in a Qui Tam case resulting in a $75.5 million settlement with technology industry giant, VMware. In 2018, McCarthy resolved a Qui Tam action against British Petroleum for $117 million. McCarthy has extensive experience pursuing false claims cases arising out of fraud and other industries against the government. He coauthored the articles "Qui Tam Litigation, A Primer for the General Litigator," "Answering the Call: Attacking Healthcare Fraud with the False Claims Act," "Recent Developments in False Claims and Healthcare Litigation," and "False Claims Act Fundamentals." He has worked with the Department of Justice and Attorneys General offices throughout the United States on False Claims cases. McCarthy has handled many consumer fraud class actions. He has acted as Co-Lead National Class Counsel in actions against some of the largest banks and credit card companies in the country, which returned hundreds of millions of dollars to consumers. He is the author of "Home Equity Loss in California Through Predatory Lending," "Combating Predatory Lending in California," and has spoken in many forums on consumer fraud. McCarthy also has practiced extensively in the area of elder abuse, including obtaining multi-million dollar recoveries on behalf of senior citizens in actions involving reverse mortgages. He has been retained by San Mateo County, Santa Clara County, Alameda County and Santa Cruz County to prosecute financial elder abuse cases. In addition, he has handled many notable cases against nursing homes, including well-publicized actions for the families of three victims who died at a San Mateo County nursing home during a heat wave, and an action on behalf of a developmentally disabled person who was severely burned while left unattended in a nursing home shower. He authored "The Elder Abuse Statute: California's Underutilized Law," "Elder Abuse: Recent Legal and Legislative Developments," "Financial Elder Abuse in Real Estate Transactions Under the 2000 Revisions to the Elder Abuse Act" and "Elder Abuse Claims Not Subject to MICRA." He is a frequent speaker on elder abuse and has been featured in California Lawyer with respect to his work for seniors. McCarthy has received many legal service awards including the Marvin Lewis Award for the Consumer Attorneys of California for guidance, loyalty and dedication, the William Nagle, Jr. Memorial Award from the San Mateo County Bar Association for innovations in the law and for professionalism, the Community Service Award from Santa Clara University School of Law for his work on behalf of consumers, the Bar Association of San Francisco’s Award of Merit, the Access to Justice Award from the Lawyer’s Club of San Francisco, the California Supreme Court Chief Justice’s Award for Exemplary Service and Leadership, the Stanley Mosk Defender of Justice Award and the State Bar of California Presidential Award for Access to Justice. McCarthy's other notable cases include compelling an insurance company to pay for a lifesaving bone marrow transplant for a cancer patient, and obtaining a punitive damage jury verdict in another case which unveiled a multi-state health insurance fraud. McCarthy obtained a defense award on a multi-million dollar fraud claim against his clients, and obtained a million-dollar recovery for the same clients on a cross-complaint in a year-long arbitration arising out of a failed healthcare industry merger. He served as lead class counsel obtaining a $15 million dollar verdict against Old Republic Title Co. after a trial in San Francisco Superior Court. He also obtained a substantial verdict against the federal government in a high profile FTCA case after a trial in federal court. He obtained a punitive damage jury verdict after trying an elder abuse case against a nursing home. He won a unanimous jury verdict in a hotly contested financial elder abuse trial involving the misappropriation of a senior citizen's life savings. In 2018, McCarthy also won a multi-million jury verdict for a MLB pitcher whose career was prematurely ended. McCarthy has tried a variety of cases in state and federal court, including class actions. McCarthy is a past president of the Consumer Attorneys of California and the San Mateo County Trial Lawyers. He was chairman of the Business Litigation Section of the San Mateo County Bar Association. He has been elected to the Irish 100, the top 100 Irish lawyers in the United States and Litigation Counsel of America. McCarthy is a three-time finalist for the Consumer Attorneys of California Attorney of the Year Award. He is currently a co-chair of the Open Courts Coalition, a diverse group of attorneys from all practice areas in California whose goal is to restore court funding. McCarthy has been an MCLE panelist on many topics including courtroom conduct, complex litigation, financial fraud, financial and physical elder abuse, the fundamentals of business litigation, Business and Professions Code 17200, predatory lending, qui tam actions, discovery for trial, witness examinations, trial of class actions, the Consumer Legal Remedies Act, Settlement Techniques, Legal Ethics and taking effective depositions. He also is active in various Peninsula community activities, including having served as chairman of the Board of Directors of Community Gatepath, a nonprofit organization which benefits children and adults with disabilities. McCarthy received ABC 7/KGO TV’s “Profiles of Excellence” Award for his work on behalf of Community Gatepath.